Split a snack box with a travel companion. The 580-calorie Rightbite from United Airlines is filled with tuna, hummus, baked pita chips, raisins and organic crackers. Or get a low-calorie snack like the turkey sandwich with light mayo from Continental Airlines (offered on flights over three hours). It comes with a small bag of carrots and a fun-size candy bar that will only cost you 285 calories. Delta offers a Clif Mojo Bar that’s high in protein (8g) and will tide you over for 200 calories. Avoid salty snacks, which dehydrate you in the already dry cabin air. Also beware of high-sugar, high-fat treats that pack the equivalent of a meal but leave you feeling unsatisfied. Prepare individual servings of dried fruit; be sure to follow the serving size on the label. For car travel, bring a cooler with fresh fruit that’s easy to pack, such as apples, bananas or grapes. Cut up raw veggies; they provide good fiber and a nice crunch. Freeze individual cartons of low-fat yogurt ahead of time for a refreshing and healthy treat. Pack single-serving sizes of your favorite high-fiber cereal in sandwich bags. When your only choice is a terminal newsstand, opt for trail mix or a low-fat, high-protien energy bar as a travel snack. But, warns Lauren Antonucci, a registered dietician and the director of Nutrition Energy in New York City, follow the serving size on the trail mix (typically about a quarter cup or a palmful) and pass what’s left on to a neighbor to avoid calorie overload. If a coffee shop is an option, beware of added calorie traps: “Whole milk, flavored syrups and whipped cream can add 300 or more calories to your beverage,” Antonucci says. Instead choose bottled water to stay hydrated while traveling. Avoid anything that’s extra meaty, supersize, fried or sugary. 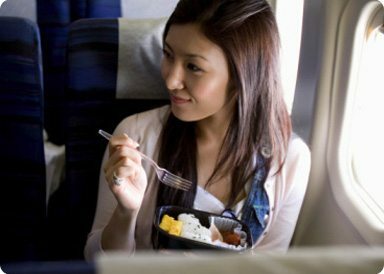 Avoid inhaling huge portion sizes by splitting an entrée with your travel companion. “High-fat, high-cal items will leave you feeling guilty, sluggish and sleepy for the rest of the drive,” Antonucci says. “Remember, you are on vacation to relax, unwind and enjoy — not to stress out or feel guilty after making bad food choices,” Antonucci says. Start the day with a filling breakfast — say, an egg-white omelet with fruit and whole-wheat toast — to avoid a bad decision at the beachside café. Stay hydrated with water and fresh-fruit smoothies. Sure, the beach may seem better with a drink in your hand, but splurging on sugary mixed drinks (piña coladas, margaritas) will cost you two to four times the calories of a glass of beer or wine, Antonucci says. And don’t forget to hit the gym if your travel plans allow it! You can find a Gold’s Gym in all 50 states and many International countries.